Flames have engulfed the roof of the historic Notre Dame cathedral in Paris, as more than 400 firefighters continue to battle the blaze on Monday. While there have been no reported deaths or injuries, the fire did claim one monumental part of the church – the spire. 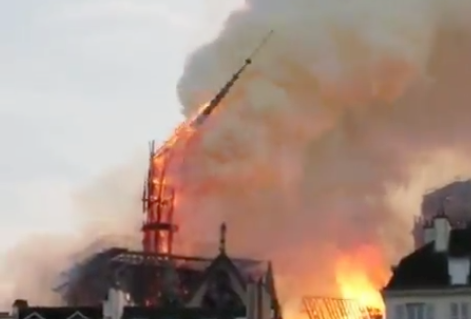 The spire collapsed early Monday afternoon and the fire continued to spread to one of the rectangular towers of the famous structure. Celebrities around the world took to social media to share their shocked reactions to the devastating blaze. My heart is broken to see Notre Dame ablaze … my wife and I went to mass there not too long ago… we saw the crown of thorns there… so much history… devastated.